helps clients achieve business value faster. Why Are Organizations Turning to SaaS and the Cloud? With its low costs and substantial benefits, including faster application deployment, greater flexibility and improved employee productivity, SaaS take-up is skyrocketing, especially across customer relationship management and human capital management. Leveraging SaaS and the Cloud can provide a fundamentally better model to drive change for both the business and IT, providing benefits from innovations previously not possible with on-premise technology and that contribute to the achievement of high performance. Reducing redundancies and achieving economies of scale in run and maintenance costs by migrating applications to the Cloud. Extending usability benefits to indirect channels via new SaaS ecosystems to collaborate in ways that were not possible before with on-premise technology. Incorporating SaaS as part of the overall architecture in new business and IT operating models to improve operations and lower costs. Achieving more impactful results by using the agility of the SaaS model to test and prove a hypothesis for a business case that is fluid—versus one that is carve in stone. Securing a true 360-degree view of the customer by incorporating social networking SaaS technologies to provide a better customer experience. How are leading organizations achieving these benefits? Long-term returns from SaaS are attained by cultivating the appropriate mindset—just get started, be fast and flexible, and don’t over customize—and by using the right planning and governance to help realize the potential for rapid speed to value and long-term business transformation. Over the last five years, Accenture has implemented more than 100 large-scale, complex SaaS implementations, drawing on over 30 years of experience in systems integration and data management. Accenture brings the right people to bear on SaaS engagements at the right time, across 17 industries and many functional domains. When it comes to SaaS, we know that implementation is important and we are highly qualified to help organizations achieve results. The Accenture SaaS Business Solutions suite —an iterative approach for delivering SaaS and Cloud technologies—provides clients the agile methods and tools needed to help them deliver third-party SaaS solutions. Strategy & Planning: Analysis and planning to determine where your organization can benefit from SaaS and the different approaches your organization can use to maximize the benefits, including governance. Agile Execution: Systems integration and technology services, as well as specific methods, tools and accelerators designed specifically for SaaS. Cloud Operations: Maintenance services and release management tools to help your organization get the most out of your SaaS solutions. Accenture Technology Labs: Where we cultivate a thorough understanding of the latest SaaS and Cloud trends, including the development of pioneering new SaaS and Cloud Solutions that can benefit your project. Accenture Global Delivery Network: Having more than 50 facilities staffed by approximately 81,000 professionals allows us to offer technology professionals trained in the SaaS and Cloud Solutions you want, at the right time at the right price. On-Shore and Off-Shore SaaS Skilled Resources: This talented pool of resources can help cut implementation times and deliver robust SaaS solutions quickly and cost-effectively. Industry Business Solutions: We can tailor SaaS solutions for your specific industry, drawing on industry-specific business processes, pre-designed business solutions, templates, accelerators and best practices learned from our work across 17 industry segments. Network of Alliance Relationships: Our alliances go beyond the typical relationship. We work with pioneering pure-play Cloud and SaaS providers including Salesforce.com, Workday and Veeva, to create new solutions. We also have deep experience in the SaaS solutions provided by our long-established Alliance partner Microsoft, Oracle and SAP. Help organizations assess and plan their SaaS strategies, and integrate SaaS solutions with existing systems in complex, global environments. Many computing platforms, across all industries, by department or enterprise-wide. Address pressing business issues in human resources, customer service, indirect and direct sales and back-office functions. In addition, Accenture has the methods and tools needed to help clients deliver third-party SaaS Solutions—from strategy and planning to execution and ongoing operations. Application Portfolio Assessment Toolkit helps analyze the technical, functional and financial information required to determine which applications are candidates for the cloud, including mapping to vendor solutions, and the different approaches your organization can use to retire, migrate, replatform and retain key applications. Used as key input for an overall application blueprint and roadmap for how to implement the changes. SaaS Proof of Value Accelerator is a pilot approach your organization can use to validate specific metrics prior to scaling for a larger implementation— helping you to deliver proven results faster. 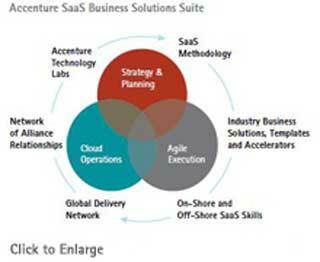 Accenture SaaS Delivery Toolkit assists in providing a disciplined approach to deliver SaaS solutions consistently, regardless of whether the work is performed on-shore or off-shore, including a method to estimate, scope, plan and deploy resources for initial and subsequent releases and enhancements. Use of the toolkit helps reduce risk and improve the quality of the solution. SaaS Global Deployment Accelerator helps provide your organization with an efficient and effective way to drive consistency in a global or enterprise deployment—for both the core solution and delivery, while accounting for regional variances in both, such as cultural approaches, regulatory issues and go-to-market channels. Accenture Partner Relationship Management Quick Start Tool helps enable your channel programs in as little as four weeks, using predefined leading-practice processes, business requirements, training, communication templates and job aides, and common business drivers and metrics. Accenture Cloud Application Factory is an industrialized delivery approach that makes it easier to migrate or build applications on a Cloud platform at lower cost using repeatable delivery processes, scalable delivery resources and proven delivery and development tools. Cloud Application Maintenance helps your organization to get the most out of your SaaS solutions, including the structure to maximize the number of releases per year you can achieve, while minimizing costs and amplifying value. Accenture has developed a powerful network of alliances with the core objective of helping our clients become high-performance businesses and governments by getting the most value out of technology investments. Our alignment with market leaders and emerging players enables us to deliver a more complete solution to our clients. Our network of alliance relationships strengthens our ability to help clients achieve sustainable IT cost reduction; reduced total cost of ownership; reduced delivery risk; and accelerated vendor identification and evaluation cycle time. Accenture and Eloqua collaborate with clients to deliver value faster, by providing SaaS-based solutions in customer relationship management, demand generation, marketing automation and lead management. Eloqua on-demand software allows executives to track campaign success, lead quality and flow, and monitor the needs of their sales prospects. Accenture has experience in implementing SaaS Solutions and integrating customer relationship management systems. Together, the two companies provide a powerful solution that delivers value to customers. Accenture and Avanade, a business technology services provider dedicated to using the Microsoft platform to help enterprises achieve profitable growth, are committed to delivering Cloud computing solutions on the Windows Azure Platform that can help improve performance and reduce costs. The teaming of Accenture and Avanade with Microsoft offers our clients the unique combination of market-leading SaaS and Cloud vision and technologies, industry insight, business acumen and delivery skills that will help them migrate to the Windows Azure Platform and realize significant benefits quickly. In addition, Accenture is delivering Microsoft Dynamics CRM as an enterprise-wide SaaS solution via Avanade Online Services—a new business which focuses on helping organizations use SaaS as a strategic means to achieve key business objectives. Accenture and Oracle are teaming to deliver on-demand subscription-based scalable CRM solutions that allow customers to leverage and customize different services at a per-month, per-user fee while efficiently managing and protecting business information. On Demand software manages the entire Oracle stack including database, middleware and applications, totaling more than 360 solutions. On Demand, with the benefit of single-vendor accountability, also offers flexible SaaS deployment options such as multi-tenant, single-tenant and "at customer," allowing tailored services based on business needs. Accenture and salesforce.com collaborate to help clients use SaaS and Cloud computing technologies and services to transform the enterprise for faster application deployment, greater flexibility and lower total cost of ownership. Working together since 2004, Accenture and Salesforce.com have helped customer relationship management Software as a Service (SaaS) solutions achieve market maturity. We are now focused on shaping the future of cloud computing and bringing the benefits seen in customer relationship management to other areas of the business, including human resources, supply chain, asset tracking and contract management. With Force.com, salesforce.com’s cloud platform, our clients can also run complete enterprise resource planning solutions, as well as any number of custom applications. Accenture and Workday are collaborating to help organizations improve their return on investment and overall business performance through superior HR and financial management solutions. Their innovative SaaS-based Solutions can help customers achieve rapid time to value. Workday Human Capital Management and Workday Financial Management use modern, standards-based technologies to provide an unparalleled level of agility, ease-of-use, and integration capability. Accenture and Veeva are working together to develop SaaS-based Customer Relationship Management Solutions built on Force.com (Salesforce.com’s Cloud platform) for the global life sciences industry. The solutions offer fully functional CRM applications that are flexible, simple to deploy, inexpensive to operate, and provide a superior user experience.